angus.org To view complete pedigree page and EPDs. click on the provided link and enter the Reg. # in the Animal Search Box at the top right-hand corner of the page. Actual BW: 83 lbs. Weigh Date: 4-10-19, 1333 lbs. Dam is one of my favorites. Can walk up and scratch her anytime. Is nicely built and made Pathfinder status with 3 @ 107. Sire is an elite calving ease specialist. Calves are probably the stoutest of the calf crop for 2018. Dam has a 731 lb. average 205 day on 5 calves. R-419 weaned off 799 lbs @ 218 days. A.I. calf out of Baldridge Bronc. 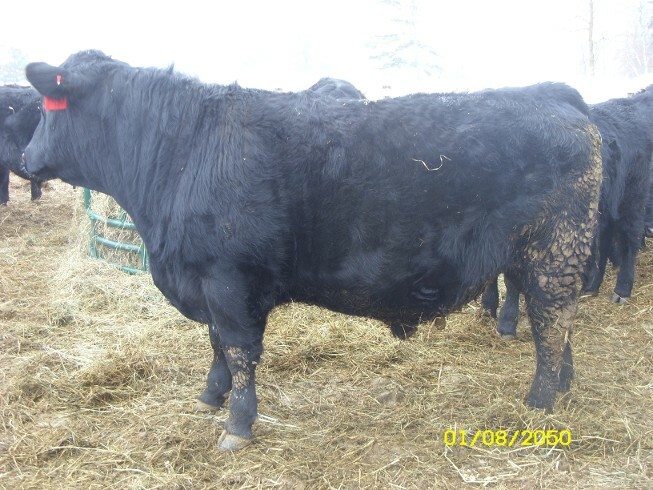 One of my best calving ease bulls, curve bender and has I believe the second best $ Beef @ +174.97 in the line-up for 2019. .